As a way to honour our father, Gerald Marshall, and his love for learning and belief in giving back, we have constructed The Gerald Marshall Centre for Transportation, at the Mohawk College Stoney Creek Campus. 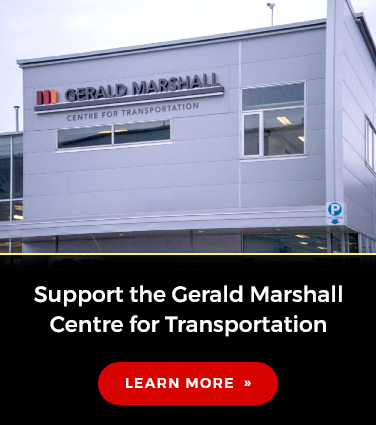 In 2006, following the passing our father and mentor Gerald Marshall, Marshall Truck & Trailer Repair Ltd. and the Marshall Family decided to honour Gerald Marshall by financially supporting the construction of The Gerald Marshall Centre for Transportation, at the Mohawk College Stoney Creek Campus. To assist our fundraising efforts, we established the Marshall Benefit Event and each year since we have raised funds in support of Skilled Trades and Apprenticeship programs at Mohawk College’s Stoney Creek Campus. We are so grateful for the many organizations and individuals who have stepped up over the past decade to join us in our efforts to raise both funds and awareness about the importance of the skilled trades. The skilled trades have been at the core of our family business for the past two generations. Gerald built G. Marshall Transport Ltd. from the ground up, and he mentored Wayne and Rick Marshall, as they grew Marshall Truck & Trailer Repair Ltd. The skilled tradespeople we employ helped keep Gerald’s fleet rolling, as well as the trucks of many of our loyal customers. That is why we are very passionate about raising funds for the Gerald Marshall Centre for Transportation. In August 2017, we announced a donation of $1.5 million to support apprenticeship programs at Mohawk College’s Stoney Creek Campus, resulting in Mohawk College recognizing our family with the naming of the Marshall School of Skilled Trades and Apprenticeship.